Phone Directory of important phone numbers for pesticide information resources in Florida. Pesticides are chemicals developed to kill pests which include insects, weeds, fungi or rodents. 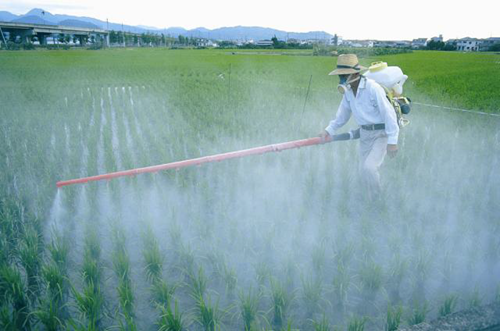 Pesticides are widely used on agricultural crops, in the home, for mosquito control, in yards, and in public places. The types of pesticides commonly used are also called insecticides, herbicides, fungicides and rodenticides. Some of the benefits of pesticides are increased crop production, preserving produce, combating insect infestations and controlling exotic species. Pesticides are designed to be harmful to pests. When not used properly, pesticides can cause harm to humans, animals, or the environment. The severity of pesticide poisoning depends on the toxicity of the chemical ingredients, the amount of the pesticide, the length of time of the pesticide exposure, and how the pesticide enters the body. Reading the label and following the directions can prevent most pesticide-related illnesses. Some people can be more sensitive to pesticide exposure. The responses of people can be very different depending on their basic health condition, age and individual characteristics. Children, elderly and people with health conditions may be more adversely affected. The frequency and duration of contact with pesticides will affects the risk of persons developing health problems. The Department of Agriculture and Consumer Services (DACS), Bureau of Licensing and Enforcement has a Registry for Pesticide Sensitive Persons, which list people who have been identified as sensitive to pesticides by their physician. The registry may be contacted at 850-617-7997. Persons on this registry are notified before a Licensed Pest Control Operator sprays pesticides for lawn care in an area adjacent to their residence. How can I be exposed to pesticide? Exposures occur when you come into contact with a pesticide and it enters the body through ingestion, inhalation, or contact with the skin, eyes or mucous membranes. A potential risk of pesticide poisoning may be present if pesticides are nearby but they must contact your body to harm you. If a pesticide is in the air, it can be inhaled and may pass into the bloodstream. If it is in food or water, or if it is accidentally swallowed, it can enter through the stomach. Certain pesticides may pass through the skin and into the bloodstream. Some pesticides may also enter through other routes such as the skin, eyes, nose and throat and cause effects in these areas. Drift or Over spray: Pesticide sprayed from an airplane, tractor or a home sprayer may drift or blow onto people living, working or going to school near agricultural fields or other nearby sites. If this exposure is due to an agricultural aerial application or is a misuse of a pesticide according to the label, the DACS, Bureau of Compliance at 850-488-3314 can be notified. If it is aerial control of mosquito the DACS, Mosquito Control can be reached at 850-922-7011. Occupational: Farm workers, applicators, or mixers may come into contact with high concentrations and large volumes of pesticides. Risky activities include mixing, applying pesticides, weeding and hand harvesting crops. Workers may unknowingly expose their families by carrying pesticides into their homes on their bodies, clothes and shoes, or by washing their work clothes together with the rest of the family laundry. Exposures of farm workers to pesticides are investigated by the DACS, Bureau of Compliance at850-488-3314. Household: Improper use, storage, and application of household pesticides such as insect repellents, foggers and baits, rodent poisons, weed killers, flea and tick control products and disinfectants can lead to poisonings when not used properly. The Department of Agriculture and Consumer Services, Bureau of Entomology and Pest Control at 850-921-4177 investigates pesticide exposures involving a Licensed Pest Control Operator. Inhaled Poison - Leave area and seek fresh air. Call Florida Poison Information Center Network (FPICN) at 1-800-222-1222.A professional staff of nurses, pharmacists, and physicians trained in toxicology are at the FPICN 24 hours a day. The staff provides poison information and treatment recommendations related to pesticide exposure. Seek medical help from your physician or hospital emergency room. Bring With You: 1) Labels of all pesticides to which you may have been exposed, and 2) Records indicating what was sprayed from the person or company that sprayed. Contact the Department of Health through the County Health Department or contact the Department of Health, Bureau of Epidemiology at 1-800-606-5810. There is no such thing as a silly question if you think someone has been exposed to a potentially dangerous pesticide. For poisoning emergencies in Florida the best way to get fast information is to call the Florida Poison Information Center at 1-800-222-1222. Specially trained nurses and pharmacists are available 24 hours a day, seven days a week to offer treatment, preventive advice and information regarding potential poison hazards. The specialist will need to obtain a thorough and accurate history of what happened to determine the severity of the exposure. If possible, bring the pesticide container to the phone so that you can provide complete information about the pesticide that was ingested or spilled. An estimated seventy percent of poisonings can be safely treated at home over the phone with the help of a poison control specialist. If it is not an emergency situation, your doctor may be able to determine if your symptoms are related to pesticides by asking questions, conducting a physical exam, or doing a blood test. You and your doctor should then report any harmful pesticide exposure to the Department of Health Pesticide Exposure Surveillance at 850-245-4444 ext 4576 or the Pesticide Hotline 1-800-606-5810, Monday to Friday from 8 a.m. to 5 p.m.. Section 381.0031, Florida Statutes, requires physicians, hospitals, and laboratories to report pesticide poisoning cases to the Department of Health. This program documents and monitors pesticide exposures in the state to identify trends in pesticide exposures and prevent additional exposures where possible. The program works directly with the Department of Agriculture and Consumer Services and the 67 county health departments to investigate sources of pesticides that may be causing human illnesses. How can I report a pesticide related incident? To report a pesticide-related illness or injury, please follow disease reporting guidelines for County Health Departments (CHDs) and Health Professionals. Contact the Coordinator of the Florida Pesticide Esposure Surveillance Program.